MIRA MESA -- The day before leaving for Pasadena and the Rose Parade, the The Mira Mesa High School Sapphire Sound Marching Band and Color Guard still has work to do. "We’ve been repping and repping and repping pretty hard for it," Junior Drum Major Brendalyn Knight said Monday. They've been working towards this moment since August of 2014. That's when the band learned they’d march in the Parade. Since then, there have been countless fundraisers, and hours of practice. The band needed to raise about $250,000 to make the trip, including the uniforms, which run $500 each. "We have 3 nights in a hotel. I have to feed all of them, 250 teenagers needing to eat is a lot of money right there," Band Director Jeanne Christensen said. They also needed new uniforms. The band has done magazine sales, candy bar sales, pancake breakfasts and any other fundraiser they can think of. They have a GoFundMe page to raise another $20,000. "We’re really just asking folks to support what we're doing," Christensen said. Raising money is only half the work. The band also has to put in the hours of practice, getting ready to march the five-and-a-half mile Parade route. It's been physically draining. "This is the hardest we’ve worked so far," Sophomore Keegan Bushouer said. "Fun runs, push-ups, everything. Miles and miles of marching." "We ran sprints, we ran around the track, we ran around the school" Senior Nikki Gonzales added. "We did a lot of running and we went straight into just marching 22 laps around the track, five-and-a-half miles." During those miles, the band will play "America the Beautiful" and "Ode to Joy." Both songs have sentimental significance to the band. "America the Beautiful" is the same arrangement the Sapphire Sound has played every year in the local 4th of July parade. It also honors the Rose Parade's theme celebrating the 100th anniversary of the U.S. National Park System. The band played "Ode to Joy" as part of Opening Ceremonies for the 2000 Summer Olympics in Sydney, Australia. To get ready for this week, the band members gave up their winter break for final preparations. They practiced every day except Christmas Eve and Christmas Day, sometimes going from 8 a.m. until 5 p.m. It will be worth it, Christensen says, to leave a good impression on the biggest stage imaginable. "We don’t want to let anyone down. 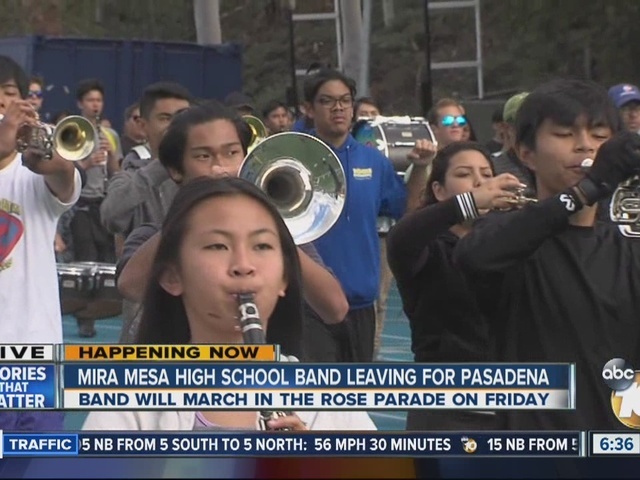 We want everyone to say, 'Wow, that band was great, yay for Mira Mesa.’"
In addition to the Rose Parade, the band will perform in the Festival of Music on Tuesday night at City College of Pasadena. They also get to lead off the Holiday Parade at Disneyland on Wednesday.